How to Read the Iliad – Everything is Oll Korrect! We’ve already met Homer’s contemporary Hesiod, and as I mentioned there, Homer has the mixed blessing of finding his work on high school reading lists. This does ensure that most people still know who he is, though I have found that one can’t take that for granted, but it also forms negative associations with his work. It’s likely that the Odyssey is one of the books you were cudgelled with as a schoolboy. That may be one reason to read the Iliad first, not just because it’s the prequel but because it’s easier to get a fresh start on it and enjoy it on its own terms as a diversion and not as something you had to do a 500-word character analysis on. The Iliad, though, is also a bit of an odd book, at least to our modern eyes and compared to the more novel-like Odyssey. It opens near the end of the Trojan War, with a dispute between Achilles and Agamemnon. At first, a reader may assume the work is about Achilles, and to a large extent it is, but he’s not even present for the majority of the poem. Feeling his honour has been insulted, he goes off to his own tent in the first book, and stays there until near the end. The rest of the book is, on the surface, just a whole bunch of men fighting and gods scheming. The Greek warlord— and godlike Achilles. Let’s set aside the details, and just say in short that Achilles, again, felt his honour was slighted by Agamemnon, so he heads off to his own tent, much to the disappointment of new readers. Achilles, after all, is one the most famous heroes in Greek literature, so naturally he should be off doing hero stuff, but instead he spends most of his time in camp feeling sorry for himself. Most of the fighting is left to the B-list heroes, and it’s not until near the end that Achilles finally comes out. Even more irritating to many readers is that his allies need him out on the battlefield, but here he is making others suffer for his personal hatred. In part, this is a literary device. Literature, as I’ve touched on elsewhere when discussing Socrates’ criticisms of Homer, must sometimes depict interior states through action to really convey these thoughts and emotions. This poem is about Achilles’ rage. How can Homer depict rage? He can’t just say that Achilles was angry, or have him say a few sharp words to Agamemnon and then get on with it. He needs to harangue Agamemnon and storm to his own tent, and then remain there implacable. This conveys that he isn’t just angry or irritated, he isn’t just having a bad day or getting into a shouting match with a bad boss. This is something beyond that, and though it may seem overblown, consider also that the Iliad isn’t about folks like us. In the Poetics, Aristotle distinguished comedy from tragedy and epic in part by their subjects; comedies concern themselves with people worse than us, but epics are about men greater than ourselves. We’re nine years into a massive ten-year war, involving kings, sages, famed warriors, men with divine ancestry, and even the gods themselves. Homer mentions multiple times that this or that character is stronger, wiser, or nobler than any man alive in our own times, and even minor characters who only show up for a few lines are often described as “good with a spear” or such, or given some other mark of distinction. We can expect, then, that even their emotions are, in some way, bigger than ours. 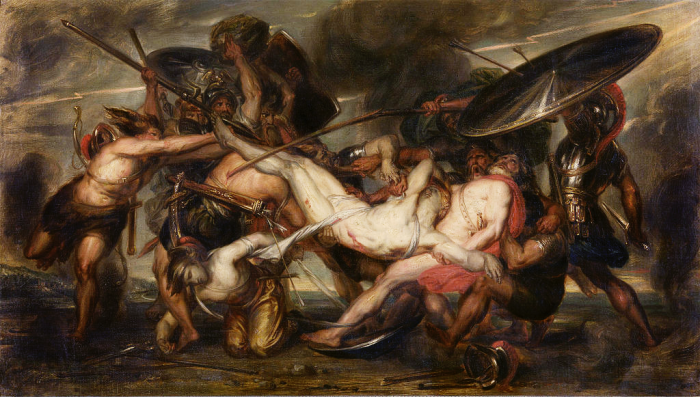 In any case, Achilles’ rage does eventually cool to the point where he allows his closest friend, Patroclus, to take the field with some of his men just long enough to avert certain disaster for the Greeks. However, if there’s one thing that will get a man in Greek literature killed without fail, it’s hubris. Patroclus accomplishes his task of saving the Greeks from destruction, but then keeps pushing, only for Hector, Troy’s greatest champion, to kill him. At this point, we finally see the sort of heroic rage many of us expected all along, and when Achilles finally takes the field he’s fighting and killing everyone from Trojan heroes to a river god to, eventually, Hector himself, whose body he proceeds to desecrate. The wrath of Achilles continues to burn, making his eventual meeting with Priam, Hector’s father, all the more powerful. I’ll set that meeting aside for now, but that’s Achilles’ story heavily abridged, but what about the other 2/3 or so of the poem? At first glance, much of it is reducible to “dudes fighting,” and a huge portion could be cut without affecting this main story. This seemingly extraneous material, however, isn’t placed there arbitrarily. For one thing, the Iliad is a history. Well, to some extent. The historicity of the Trojan War is a contentious issue, but ostensibly Homer is narrating a story from a real event from long before, and so like a historian he’s telling us everything that happened during this phase of the war, albeit in a stylised fashion. This is one possible explanation for why the Catalogue of Ships is there, where Homer lists all of the Greek commanders, where they came from, and how many men they brought with them. Much like the Bible’s genealogies, modern audiences tend to find this dreadfully boring, but it makes more sense if these people were actually there and this is who they brought with them. Even if this is completely fictional, it still gives the poem a more authentic feel. Regardless, the ancients had a much stronger sense of place and pride in their own ancestors than we generally do today, and so delighted in this sort of thing. Diomedes grinned when he heard all this. “We have old ties of hospitality! And I your guest whenever I travel to Lycia. Clasped hands, and pledged their friendship. Not only is this just a good story on its own, it’s also a striking example of how seriously the Greeks took the laws of hospitality, as these two men are unable to fight each other not because they themselves are old friends, but because their grandfathers were! Into the pit of his belly. He collapsed in a heap. Then fell in the dust. His spirit fluttered off. As it dies beneath the predator’s jaws. Homer is justly famous for these similes, which are both excellent in themselves and do a fine job heightening the effect of what he describes. Now, Sarpedon was a major character, but interestingly, Homer doesn’t have many “redshirts” on the field. Whenever he mentions a major character killing someone, he’ll at least give the victim’s name, and often tell us something about him. Whom Telamonian Ajax marked and hit. Where she had gone to see her family’s flocks. Down to the ground and lay in the dust. To curve it into a pole for a fine chariot. And now it lies drying by the river bank. This is the only time Simoeisius is mentioned in the whole poem, but we know where he’s from and a little about his background, and Homer does this many times throughout the poem. What this does, and what all this seemingly unnecessary material does, is give us a sense of the scale of this war and the stakes involved. Because there are no anonymous soldiers, all the many deaths carry some weight. Homer spends a lot of time praising martial prowess, but he doesn’t pretend war has no consequences, either. There’s one more issue to address before leaving, because I’ve noticed that one reason some people begin the Iliad*but then give up on it comes down to choosing a poor translation. 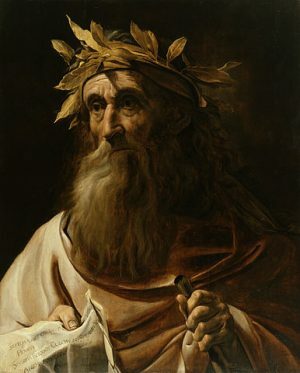 With old literature it’s tempting simply to get a cheap or free ebook edition, but with so many translations of Homer of varying quality, this is really a roll of the dice. Don’t do that. My favourite is Robert Fitzgerald’s, so if you just want a recommendation, go with his. I’ve also read Stanley Lombardo’s, whose version I’ve used above and which is also enjoyable; it’s also rather modern and casual in places, which I have mixed opinions about but which some readers may prefer. Richmond Lattimore’s and Robert Fagles’ are also popular and probably worth a look. For the more adventurous, George Chapman’s and Alexander Pope’s are the most popular older translations. These are more poetic than modern versions, but be aware that they can also be more difficult to follow if you’re not used to their style of poetry. Also, Chapman’s is significantly longer because he expands on the poem in many places. I recommend taking a look at Wikipedia’s convenient list of English translations of Homer, which includes the first several lines from most common versions, and going from there. The Iliad is one of those books that whole other books have been written about and it fully deserves its extraordinary reputation, so I’ll end with one final observation. The epic poem is my choice for the greatest medium in the arts; there aren’t a lot of them, relatively speaking, because they’re so challenging to write. However, they’re also disproportionately well-represented on any list of “greatest books ever written.” I’ve already mentioned the authors of the Metamorphoses, Aeneid, and The Divine Comedy. We may also add Beowulf or, much later, Ezra Pound’s Cantos. G. K. Chesterton is somewhat overrated, but I’d wager that his Ballad of the White Horse will be his longest-lasting legacy. Even a comedic epic like Lewis Carroll’s The Hunting of the Snark has some weight to it. We could list more, but the point is that getting one epic into the Western canon is an impressive achievement. Homer, though, managed to write two (yes, I’m setting aside the Homeric Question). This fact makes him a powerful contender for the greatest and most essential author in Western literature.